My sister’s happy place is Lake Tahoe. Her family vacations there about once a year, mostly in the summer, but I haven’t managed to get there for almost 20 years. However, after spending a week hiking Tahoe with my girlfriends last month, I finally understand why it’s her happy place. Lake Tahoe and its surrounding lakes, peaks and trails is one of the most beautiful spots in the US. If you just visit Lake Tahoe to ski, when it’s covered with snow, let me tell you, you’re missing out (cue my sister saying I told you so). My gal pals and I try and get together for a week every fall to complain about our husbands to enjoy each others company and catch up on our respective lives. Most often we choose a warm-weather destination, like Mexico, where we sit on the beach and drink cocktails and eat delicious and filling Mexican food most of the day. But this year, we were ready to burn calories instead of consume them, and Lake Tahoe sounded like the place to get that done in the great outdoors. The five and a half hour drive from my hometown of Ashland, OR, and the short plane ride for one of our group traveling from San Diego made it a good location to spend a week hiking, cooking and eating great food, sipping cucumber & basil infused martinis, and talk—and talk, and talk, and talk, and talk. We stayed at the Marriott Timber Lodge in South Lake Tahoe, a lovely vacation rental just a short distance from the many hiking trails we would tackle during the week. South Lake Tahoe borders Nevada and California, so if you’re a gambler, there are plenty of places you can stop in to lose your money. Lady luck is not my middle name, so when we weren’t hiking we were sitting in our hot tub, or catching up on our favorite Netflix programs. Our adventures on the trail tired us out though, and we often found ourselves in bed by 10pm (this comes as “shocking” news to my family, as it’s rare that I’m not in bed by 10pm even if I sit on the couch all day). 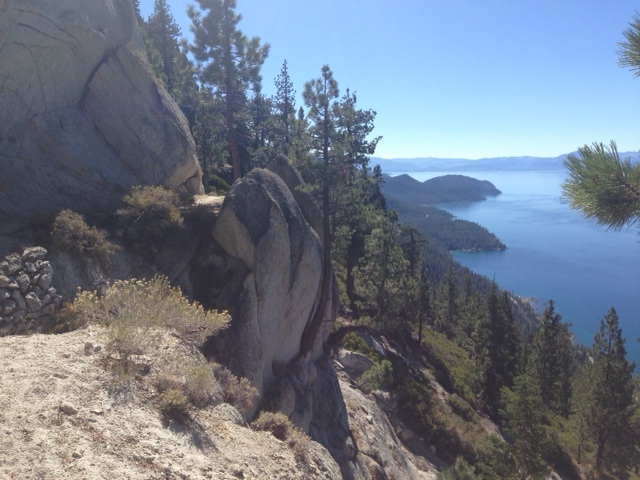 We hiked several gorgeous trails over the week, including the Echo Lake Trail, the Rubicon Trail, and my absolute favorite, the Flume/Tahoe Rim Trail. 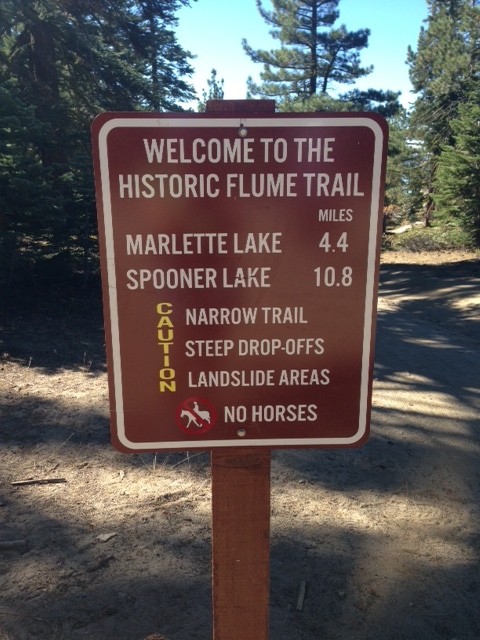 Popular with mountain bikers, the 14 mile one-way Flume Trail offers spectacular views of both Lake Tahoe and Marlette Lake. The most scenic part of the hike is about nine miles in, so rather than try a round trip hike of 18 miles, we opted for a one way shuttle ($10 each), from Flume Trail Mountain Bikes Shuttle http://flumetrailtahoe.com/. They picked us up at Spooner Lake, the spot we would end our hike, and shuttled us to the trailhead in Incline Village. We saw at least a dozen mountain bikers that day, riding their bikes on the narrow dirt trail that often runs very close to the cliff’s edge. (I’ll stick to hiking thank you very much.) Other than the bike riders, we were all alone under a big blue sky. 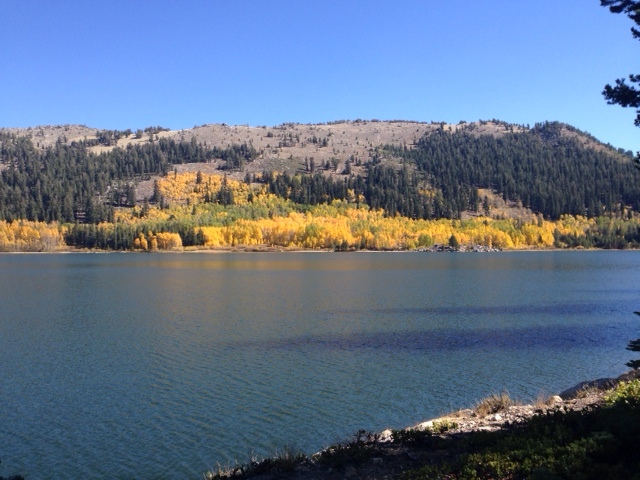 It was a gorgeous fall day, and the leaves were changing colors ranging from yellow to orange to brown. 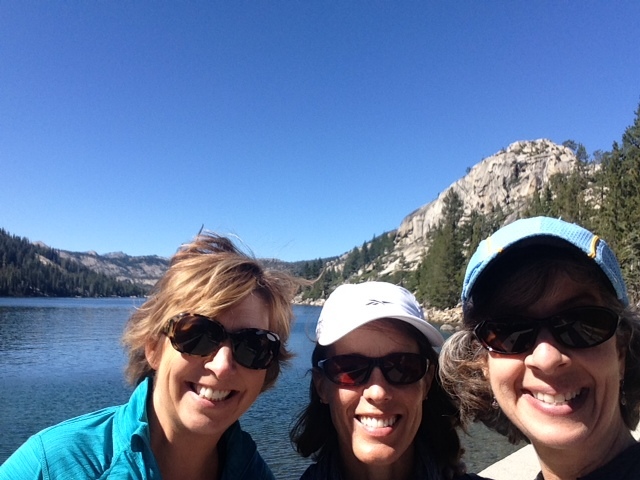 The lakes were a deep, clear blue and I felt grateful to be hiking in such a beautiful spot, with such great friends. We were tired at the end of our day, and the last couple of miles seemed to go on forever. But water never tasted better, and I swear that the homemade sandwiches we made to eat on the trail were as good or better than the delicious Mexican food we’ve eaten on the beach in Puerto Vallarta on other girls’ trips. I think I’ll call Lake Tahoe my happy place too, that is if my sister is willing to share.